Some people use their leftover egg whites to make macarons, some meringue, but here, in Serbia, we make komisbrot. 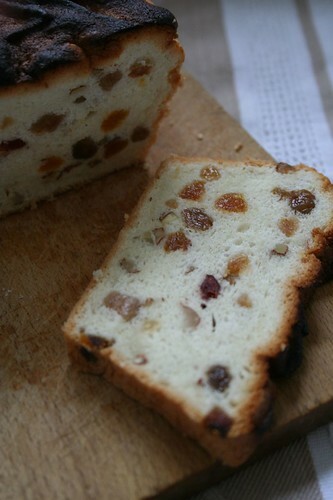 Although it’s name resembles kommisbrot – a German army rye bread, it’s not a bread, but a kind of fruitcake. What is sure is that it certainly has some German/Austrian background, but apart from a women magazine’s story, I wasn’t able to find out about it’s origins. If anyone knows anything about the true story, please let me know. “Wilhelm von Lidl wasn’t as rich as other nobles of his rank, but he had more beautiful and fulfilled life, filled with love to his wife Luiza. Even when they got old, they had something to talk to each other, and their favorite evenings were the ones when through their stories they relived all those beautiful travels from their young age, and remembered all the adventures and people they met. 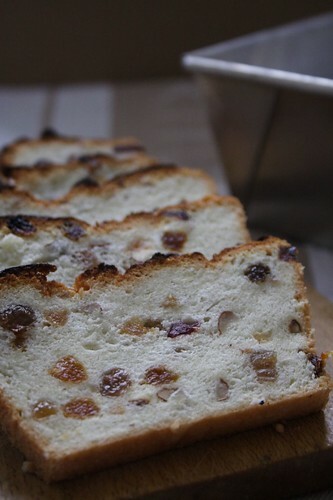 During one of those evenings, Wilhelm yearningly remembered the outstanding dried fruit cake from Siena, that they once bought somewhere in Italy. “Even if we traveled to Italy, I could never eat the cake, for it’s too hard for my worn teeth”, he said sadly. Take egg whites from 5 large eggs. Measure their volume, it will be your reference. Take the same amount (as egg whites) of sugar, flour and mixture of various chopped dried fruits and nuts and 1/5 of the initial egg amount of oil. Take 1-2 Tbsp of already measured flour and use it to coat nuts and fruit. 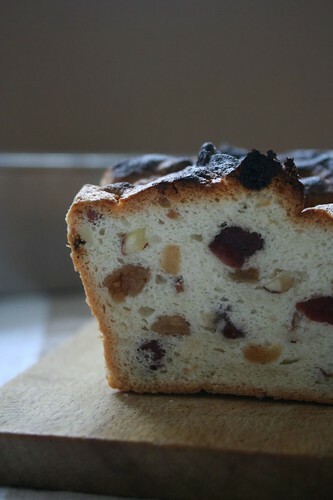 I used mixture of: raisins, fig, apricot, almonds and cranberries. Beat the egg whites with a pinch of salt with a hand mixer. Gradually add sugar. Continue with a mixer until it’s well combined. 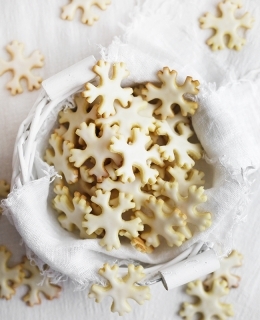 Gradually stir in sifted flour with a spoon, and then nuts and fruits. Finally, stir in oil. Grease loaf pan, and then dust it with flour. Pour in komisbrot mixture and bake in a preheated oven on 180°C for about 20 minutes. 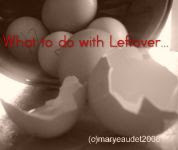 Note: This is a part of What to do with Leftover… Eggs event. What a lovely story. I love your blog. Its beautiful. I don’t know how you manage to make so many wonderful things so often. Keep up the good work. Thanks Heaven!Actually, I had a spring break at the university. Classes started yesterday, so I guess it will be more studying and just a little less cooking. Heavenly looking, and a very interesting post! 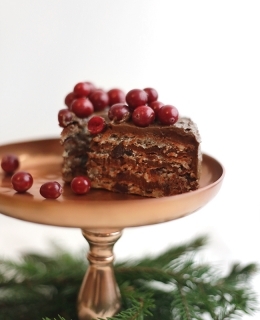 I love the idea of light fruitcake and the story was fun to read. Thanks for the recipe! What a light and beautiful cake. I will definitely try this cake. 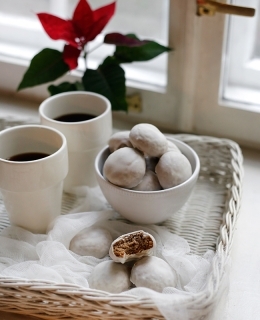 Dear Marija, I found you on twitter via Rosa's Yummy Yums and I'm so delighted. What a wonderful blog! In April and May, my husband and I visited several contries of former Yugoslavia (Serbia, Croatia, Montenegro, Bosnia-Herzegownia, Macedonia, Albania) and I will try some of your recipes soon. "Komisbrot" is my favourite, I was just thinking about the eggwhites in my fridge, not knowing, what to do with them. Now I know… thank you! Hej, upravo se spremam napraviti ovo, jel mi vjeruješ da ja ovaj kolač nikad nisam probala. Kako mi je ostala tona bjelanjaka od sirnice (one naše uskrne pogače) morala sam naći nešto u čem ću ih potrošiti. Prvo sam mislila raditi macarone, ali ne da mi se zezat s njima. Iskreno da ti kažem ovaj kolač mi zvuči puno ukusnije. Javim ti rezultat ali nisam sigurna da ću stići napraviti i fotke. Sad sam tek skužila u potupnosti novi dizajn bloga i mogu ti reći da sam oduševljena!